Most people have some degree of familiarity with the Rhône wines of Southern France. They have typically heard of Grenache, Châteauneuf-du-Pape, or Côtes du Rhône. However, many people may not be aware of some of the other red wine regions, such as Vacqueyras, that can produce amazing reds for great value. This blog will try to explain a little about the history and basics of the southern Rhône and the wines that come from the Southern Rhône Valley region. Hopefully this will inspire you to discover and enjoy the Rhône as much as I do! The Rhône Valley is a wine region in southeast France and is named for the Rhône River that runs through the region on its way to the Mediterranean Sea. The Rhône River separates the Alps from the Massif Central, an elevated and mountainous part of southern France. The north is mountainous ancient granitic rock. The south is partially an ancient seabed with calcareous clay and limestone. The river has deposited sand, flinty pebbles, and clay silt as well. This gives growers a wide variety of different soils and terroir to choose from in the Rhône. And given the range of soils as well as the variance of elevations in the region and the diversity of available grape varieties, styles of wine vary greatly from big, long-aged Syrahs to bright and cheery rosés. 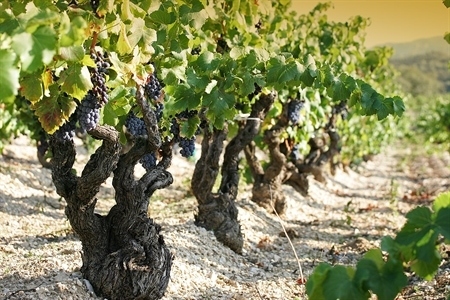 Rhône wines are some of the most ancient in France. Evidence has suggested that the Greeks were growing grapes in the fourth century BCE in Marseille and in the first century BCE in the northern part of the Rhône Valley. A good deal of the success was due to the presence of sandstone clay deposits allowing the Greeks and Romans to easily make their earthenware jars, amphorae or dolia, which were used to transport wines as well as the famous roman fish sauce. The Romans had a lasting impression on the area. They established many of the towns and vineyard sites that still exist today. At the height of the Roman Empire, the Rhône Valley wines were rivaling those from Italy in terms of quality and production. Yet after the fall of the empire, the export markets for Rhône wines dried up and great interest wasn’t renewed again until the Catholic Church rediscovered the amazing wines of the Rhône in the middle ages. As with many wine regions in France, the Catholic Church has had a role in forming the wines made in the present day and establishing some of the best vineyards. In the late 13th century, the French king Louis VIII granted a parcel of land to the Catholic church around the town of Avignon called Comtat Venaissin. Also in the late 13th century, riots and general unrest ushered in a chaotic time for Rome. Politically speaking, the church had lost the respect and control of the nobles around Rome to the point where they no longer granted military protection. Following the election of French bishop Clement V to the papacy, he moved the papacy to the Southern Rhône region around the town of Avignon. A general rumor at the time was that the goal was to cozy up to the King Philip of France for political power. Regardless of the explanation, this ushered in the Avignon Papacy that lasted from 1305 until 1378. While this blog is not about Châteauneuf-du-Pape (French for “new castle of the Pope”), it is worth noting that the church ushered in a renaissance of Rhône wines and invigorated the region. The quality summarily increased, vineyard sites were replanted, and the export markets began to grow again. Even though the popes eventually moved back to Rome, the Rhône was on the map and the wines were firmly established. Trade was flourishing due to the high reputation of the wines, and local ports were busy. Due to increased popularity, local wine regulations were introduced in 1650 to guarantee provenance and quality. First known as Côste du Rhône, the famous name of Côtes du Rhône was established in the mid-18th century and validated by the courts in 1936. Baron Le Roy, a grower in Châteauneuf-du-Pape, championed the establishment of a governing body to maintain and regiment wine appellations. The Baron also successfully lobbied for the first AOC in the Rhône in 1933. The terms and limits he set forth became the standard for all subsequent AOC regions (appellation d’origine contrôlée, or controlled area of origin). To this day, the entrants follow limits on growing area, grape varieties, local practices, cultivation methods, minimum alcohol content, and harvest periods. Baron Le Roy later became involved in the founding of the INAO (Institut National de l’Origine et de la Qualité), the governing body that eventually took over the governing of all AOC regions and entrants, and presided over it from 1947 to 1967. The Southern Rhône accounts for nearly 95% of the total Rhône wine production, and the majority of that is red. Most of those are wines based on blends with Grenache as the star player. The popular blend is called a GSM, as it consists of Grenache, Syrah, and Mourvedre, and Cinsault is frequently included as well. The Côtes du Rhône is the largest appellation and the base designation for wines for the entire Rhône. While it’s possible that a Northern Rhône Syrah could be de-classified down to the Côtes du Rhône level, it is more than likely to be a Grenache-based wine from around one of 17 different villages or a blend of all the villages intended to achieve a certain style. Usually lower in price than the more prestigious regions, the quality for the price is very high. Imagine a large pyramid: at the bottom of the pyramid is the base (and obviously the largest part)—this is the space reserved for Côtes du Rhône. The next level up is referred to as the village level. As of 2016, there are 17 villages or communes, and the label must bear the name of the village as well as the title Côtes du Rhône. In this case, Seguret is that village. If it is a blend from more than one village, the village names will be left off and just “Villages” will be present. Some of the communes and villages have been awarded their own AOC designations or named areas, and these make up the next-highest level in the quality pyramid. Gigondas is made from at least 50% Grenache, and compares to its more famous cousin Châteauneuf-du-Pape in a lot of ways including soil type, ageing, and winemaking. Larger than Gigondas and known to be a bit more rustic, the same rules apply, as does the similarity to more famous regions with better value. This region can have more variable quality due to its size but if you look carefully, you can find some great wines. Similar to Gigondas and Vacqueyras in that Grenache is the star but not as well-known, these regions produce great value wines (but not necessarily cheap). They sit above the village level and are a great choice for lovers of richer, new-world-style wines. I hope you enjoy your wine travels through the Rhône. There is so much more still that has not been mentioned here, including the amazing whites, rosés and dessert wines to try. Cheers!